If you find ancient Swedish culture interesting, there is only 60 km to Huseby, where you find attractions such as a display of the natural features of the district, a cotter museum, guided tours of the manor house and much more. Bargain shopping for clothes and many other items you find in the city of Ullared, about 100 km from Bolmen. You may also combine a fishing trip with a trip to Kosta (120 km) where the ones interested in sports-fishing can catch the fish for your lunch while the others may prefer to shop for glass-items. Kosta is located in the ”Crystal Kingdom”. Missing the urban life? – Växjö, which also is the seat of the provincial government, is only 80 km away. For those interested in nature and the life of wild animals, you will find several national parks not far from Bolmen. 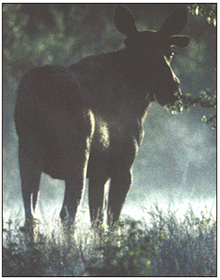 Maybe, if you are lucky, you will see the ”King of the Forest” – the swedish moose in his natural surroundings. We also recommend you try the bike- and wandering trails around Lake Bolmen and through the village of Bolmen.